The Turks & Caicos Islands are world renowned for their pristine beaches, underwater scenery and crystal clear water. Rich vibrant colors cover the tranquil landscape against majestic blue skies. Artist Lise Thompson knows the islands well, having first come to live on Providenciales (Provo for short), over 40 years ago, long before it became a popular tourist destination. 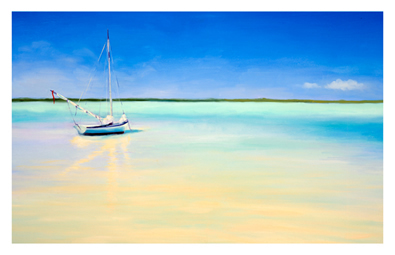 Lise captures the spirt of the Turks & Caicos Islands through her artwork, bringing forth a variety of picturesque scenes of Provo, Grand Turk, Water Cay and Middle Caicos...all filled with vivid imagery and breathtaking scenery. Original oil on canvas. Select paintings only.